The Catholic Church Is Right About This Gardasil Issue. Update: Catholic Church lifts ban on HPV vaccination. I want to say a thank you to the Catholic Church in Trinidad and Tobago. I share your deep concern in this matter and I stand firmly with you. Even if there were no problems with the vaccine, - and there ARE - it is absolutely wrong to attempt to dump a vaccine on minors without allowing parents the time and means to assess the purported benefits and the recorded problems. Parents must take the time to make informed decisions and if they decide to allow their children to accept the vaccine it should be made available at medical centers so that they can go there to receive it. Serious problems with Gardasil have been reported. I will just cut and paste some information which is widely available on the Internet. Gardasil Death & Brain Damage: A National Tragedy. The Dangers Associated With Gardasil. Gardasil is manufactured by Merck, Inc., and promoted as a cervical cancer vaccine. According to official product information, "Gardasil is the only cervical cancer vaccine that helps protect against four types of human papillomavirus (HPV): two types that cause 70 percent of cervical cancer cases, and two more types that cause 90 percent of genital warts cases." The manufacturer states that Gardasil is for girls and young women ages 9 to 26. What are the dangers associated with Gardasil? Among the official side effects listed by the manufacturer are pain, swelling, itching, bruising and redness at the injection site; headache, fever, nausea, dizziness, vomiting and fainting. Sometimes fainting is accompanied by falling with injury, as well as shaking or stiffening and other seizure-like activity. Patients who are severely allergic to yeast should not take Gardasil. However, since the drug's introduction in 2006, the Vaccine Adverse Event Reporting System (VAERS) has received more than 15,000 reports of adverse side effects related to Gardasil. These reports include serious adverse side effects including Guilliane Barre, lupus, seizures, paralysis, blood clots, brain inflammation and many others. There have been 44 reported deaths as a result of Gardasil uses. Then, on October 25, 2009, Dr. Diane Harper, lead researcher in the development of two human papilloma virus (HPV) vaccines and director of the Gynecologic Cancer Prevention Research Group at the University of Missouri, told an audience of medical professionals that Gardasil is largely unnecessary, and that it has never been fully tested on females under the age of 15. This, despite strong marketing efforts to make the drug mandatory for girls, and product literature and advertising that state the product can be used by girls as young as age 9. Dr. Harper's remarks were made to an audience at the 4th International Public Conference on Vaccination. During this talk, she said 70 percent of all HPV infections resolve themselves without treatment within a year, and that within two years that number climbs to 90 percent. Of the remaining 10 percent, she said, only half will develop into cervical cancer, resulting in "little need for the vaccine." She also said incidences of cervical cancer are steadily decreasing with conventional treatments and preventative measures. The following is an excerpt from the website "The Truth About Gardasil." "Since the drug’s introduction in 2006, the Vaccine Adverse Event Reporting System (VAERS) has received more than 18,000 reports of adverse side effects related to Gardasil. These reports include serious adverse effects including Guilliane Barre, lupus, seizures, paralysis, blood clots, brain inflammation, severe fatigue and weakness, heart problems, shortness of breath, chest pains and many more. I’m sure many people reading this will say ” Every vaccine has it’s risks”, to be followed by the statement, “Well surely the benefits outweigh the chance of any adverse side effects”. Let’s see what Dr.Diane Harper, lead researcher in the development of two human papilloma virus (HPV) vaccines and director of the Gynecologic Cancer Prevention Research Group at the University of Missouri, told an audience of medical professionals on October 25, 2009. And remember, this is coming from a developer of the Gardasil vaccine! She says, “Gardasil is largely unnecessary, and that it has never been fully tested on females under the age of 15. This, despite strong marketing efforts to make the drug mandatory for girls, and product literature and advertising that state the product can be used by girls as young as age 9. Dr. Harper’s remarks were made to an audience at the 4th International Public Conference on Vaccination. During this talk, she said 70 percent of all HPV infections resolve themselves without treatment within a year, and that within two years that number climbs to 90 percent. Of the remaining 10 percent, she said, only half will develop into cervical cancer, resulting in “little need for the vaccine.” She also said incidences of cervical cancer are steadily decreasing with conventional treatments and preventative measures. Add this to the fact that Merck’s own website says this vaccine is not intended to take the place of regular check ups and pap smears. Then why take the chance and let your daughter be injected with Gardasil? This vaccine that contains chemicals such as an aluminum adjuvant – that has been linked to the Gulf War Syndrome, also contains polysorbate 80 – shown to cause infertility in rats, as well as sodium borate – a common roach killer that has been attributed to causing unconsciousness, seizures and death — this chemical is said to be carcinogenic and known to cause cancer. Also according to Merck’s website 60% of the American population has HPV. They fail to mention that HPV is a medical term used for many different warts, 99% which are harmless: Planters warts, Flat warts, etc. Gardasil is intended to protect againist FOUR types of HPV. But there are over 120 different strains of HPV. –Over 100 of these strains cause harmless warts (you’ve had them as a child, probably) that cause warts on the hands/feet. They do no harm. Over 30 of these strains remain invisible and disappear by themselves. –10 strains are caught ONLY through sexual contact. Most of these go away by themselves. They do not cause cancer. –10 strains cause warts on the genitalia. Caught by sexual contact. They do not cause cancer. –4 strains are only caught by sexual contact and can lead to cervical cancer. However, you have a 92% chance of surviving cervical cancer after being diagnosed with these strains. Less than .8% of the population carries one of these strains. "The school-based phase of the HPV (human papillomavirus) immunization programme which will provide Gardasil vaccine for girls from 12 years old is about to start. Given the debate on the failure of informed consent processes with the MeNZB immunisation programme, and a troubling start to the national HPV immunization programme launched in September last year, it is timely to raise concerns about the fate of informed choice and consent in the school-based phase of the programme. Christy Parker looks at some of the ethical issues surrounding mass immunization programmes targeting children and young people and argues that the principles of informed choice and consent must not be compromised by population health objectives." A band, band, band of par-liar-mentarians. It's a sin, sin, sin, sin, sin! [Uproar!] Stop taking it cool! [Uproar!] Don't be played for a fool! In this band, band, band of par-liar-mentarians. Who arranged the score so impure? [Uproar!] Say, "Enough is enough!" From this band, band, band of par-liar-mentarians. Complimentary to cause disturbance at striking performance - Arrogance! [Uproar!] How much more must we take? Sound engineers stop kicksing, can't you see that the mix need fixing? [Uproar!] Time to clench your fist! [Uproar!] Stand up and insist! Yes, they wining up in the people's face! Make your jail alone, ripe and rot like fig. [Is only black man making a jail]. The verdict is always the same - "Not guilty." Hold black youth in the grappe, who you feel go take the rap? And if they try to talk, man, is sour grapes. Tell me when, oh, when will it prevail? What is the message they trying to send we? Why the hell you want to jail a millionaire? Why the hell you want to probe, who you feel you go disrobe? He's a noble son of global fame. Equal justice, equal justice, equal justice, equal justice...! While fathers kill their sons, their daughters and their wives. Start to fall on the children? With love we cannot buy, no matter how we try. In cages that all fail yet keep us tied in jail. If you doh really feel it, then you ain't have no feelings. Or pray for better weather, may we never get a hurricane. Puncheon at the system while the Forres Park is up in flames. It gushing like a faucet, nobody cannot cross it. I feel mih country bleeding, I had to bleed these lines. On the gurney for surgery in a State of Emergency. I feel a sharp pain stabbing me 'til they get to eat. But we doh know what time it is, no dial in Arima. If all you children be the immune system. 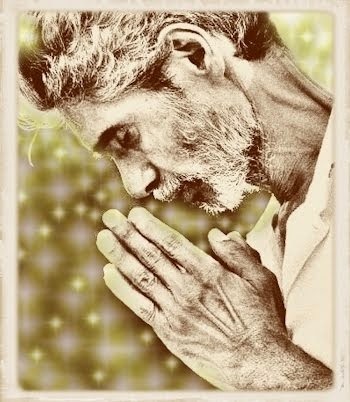 We just wanna live at peace with the master. And the police is dey way of sayin' come and take yuh meds. Would really come together, call it mental meditation. Source: Lyrics were provided here. José Mujica: How One World Leader Is Keeping It Real. After Years in Solitary, an Austere Life as Uruguay’s President. By Simon Romero | The New York Times | January 4, 2013. Photo by Matilde Campodonico for The New York Times. "MONTEVIDEO, Uruguay — Some world leaders live in palaces. Some enjoy perks like having a discreet butler, a fleet of yachts or a wine cellar with vintage Champagnes. Then there is José Mujica, the former guerrilla who is Uruguay’s president. He lives in a run-down house on Montevideo’s outskirts with no servants at all. His security detail: two plainclothes officers parked on a dirt road. 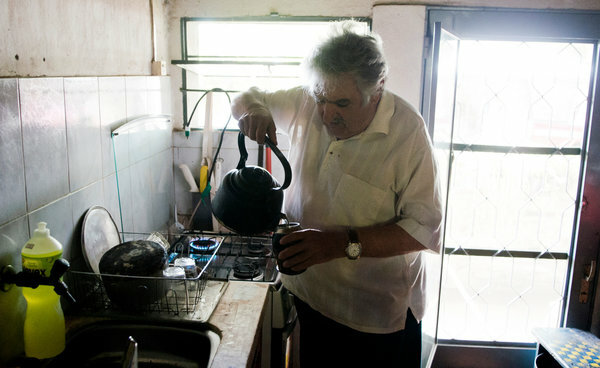 José Mujica shunned the presidential palace for his modest home on Montevideo’s outskirts. Some of the other Tupamaros who were placed for years in solitary confinement failed to grasp the benefits of befriending rodents. One of them, Henry Engler, a medical student, underwent a severe mental breakdown before his release in 1985. Mr. Mujica rarely speaks about his time in prison. Seated at a table in his garden, sipping his mate, he said it gave him time to reflect. “I learned that one can always start again,” he said. A version of this article appeared in print on January 5, 2013, on page A1 of the New York edition with the headline: After Years in Solitary, an Austere Life as Uruguay’s President." Thank you, José Mujica, for your inspiring example. Not all leaders can sustain the asceticism of the guerrilla [or the appearance of it] beyond the campaign trail. The seduction of power and the pursuit of "La Fantasie" is something very few can resist. Trinis join in prayers for ailing Chavez. "Venezuelan Ambassador Coromoto Godoy-Galderon and John Sorrillo, teacher at the Institutes of the Venezuelan Embassy, pray during the Mass at the La Divina Pastora RC Church in Siparia yesterday. The Mass was said for Venezuelan President Hugo Chavez, who is being treated for cancer in Cuba. The local community joined hands with Venezuelans yesterday with prayers for ailing Venezuelan president Hugo Chavez with a special mas at the La Divina Pastora Church, Siparia. Although there has been talk about who would replace Chavez if he were not able to resume the post as president, Ambassador Extraordinary and Plenipotentiary designate Coromoto Godoy-Calderon said Chavez was expected to make a full recovery. Chavez, who was first voted in as president of the oil-rich nation in 1999 under the United Socialist Party of Venezuela (PSUV), underwent his fourth cancer surgery in just 18 months on December 11. He has not been seen in public since. Yesterday, he was said to be still in hospital in Havana, Cuba, suffering from “respiratory deficiency” after complications from a severe lung infection. Speaking with reporters yesterday, Godoy-Calderon said the service was one of many being held around the Caribbean, South and Central America, as Chavez had touched the lives of many around the world. “Women and men all over the world are praying for him and we are so thankful to the people of T&T,” she said. “When we came to the mass, we realised that people here really understood the difficult times that President Chavez is going through. With the prayers and the love of the people, he will recover.” She said her compatriots have been praying more than ever and they are adamant that their “Comandante Chavez” will return to the helm. 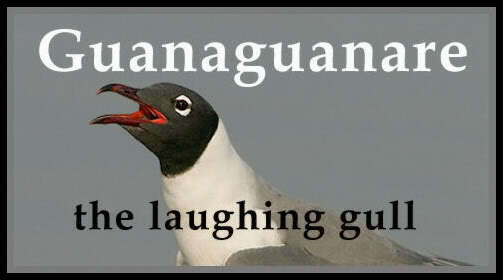 Thank you, fellow Trinbagonians. I won't use the opportunity to preach about how we tend to ignore the places and persons closest to us while rubbernecking at every inane detail of the happenings in the usual more distant places. 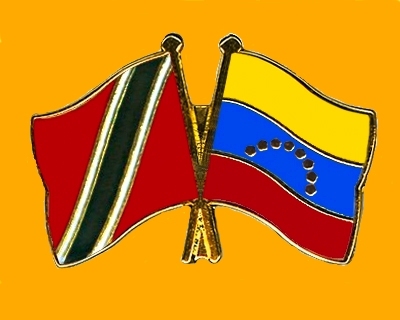 I am just grateful today for those Trinbagonians who remember that we are before anything else, the Caribbean in Latin America, and that Venezuela is Trinidad and Tobago's closest neighbour in the world. Comandante, you are also in our prayers and thoughts and conversations out here. We kept vigil all through the holidays and will continue to do so until you have recovered. I hope to hear you singing once more when you return to your homeland. You were my best teacher in the school of the copleros."